Description: This listing is for ONE magazine; and one was all we had. From the collection of one of our many Georgia Cousins, Here is the standard factory Magazine for those popular .300 Winchester Short Magnum chambered Browning Semi Auto Rifles, post 1993 Safari Mark II. Manufacturer is Mec-Gar of Italy, under license of Fabrique Nationale and Browning Arms; and Importer is Browning Arms of Morgan, UT. Construction is blue steel body and spring, with black polymer cartridge follower. 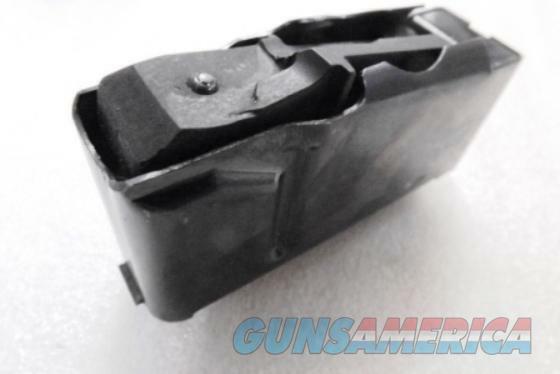 This magazine holds 3 rounds of .300 WSM Caliber Ammunition. It will only work in Browning Center Fire Semi Automatic Rifles with Mark II written on it somewhere, and only the ones in .300 WSM, Winchester Short Magnum caliber. Surface detractions are negligible on this magazine, we rate it as Excellent, 95 percent vicinity by our estimate, but photos ought to suffice for our distinguished shoppers to judge finish grade for themselves. The 2002 Mark II Stalker it came with, had not been fired more than 60 times. Replacement pricing nowadays, if a person can even find One of these, is upwards of $75 apiece. We’re offering the magazine in the photos, however, for only	$49.00. Not for sale to residents of New York City. Any magazine deliveries into New York City require written permission from the Police Commissioner, so we cannot ship magazines into any of the six boroughs or 176 some odd zip codes, per NYC Code 10-131.10. Connecticut buyers must furnish us a copy of your State Issued Eligibility Permit or Ammunition Certificate, per P.A. 13-220. Any ammunition, firearms or personnel showing in any of our photos are Not included.